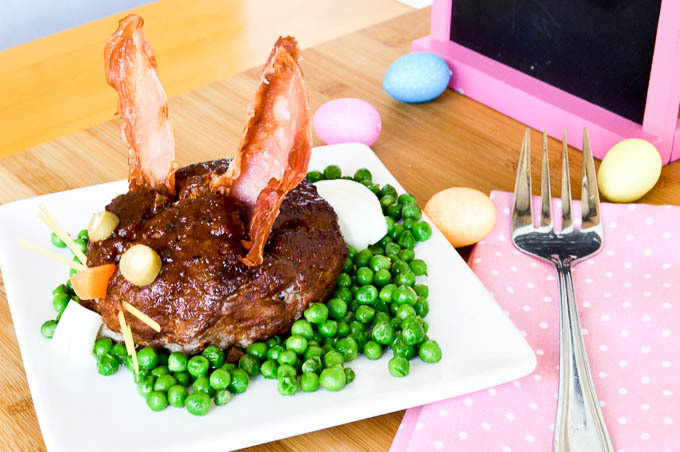 Easter Food Ideas: Easter Bunny BBQ Meatloaf! Let your Easter Buffet have a conversation piece! This juicy meatloaf is flavorful and gives a surprise when its cut into! Looking for Easter Brunch Ideas? 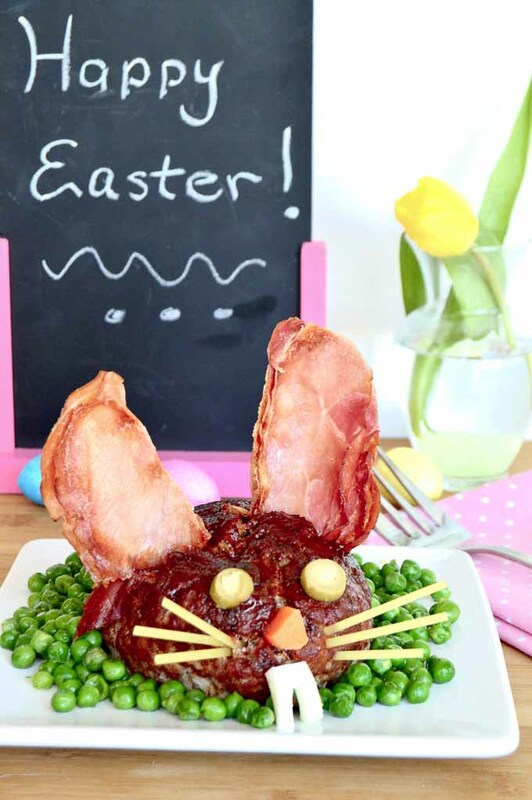 This adorable Easter Bunny BBQ Meatloaf is a recipe that uses my tried and true meatloaf recipe (minus the bacon wrap,) but served for Easter in the shape of a bunny! And in the Easter egg tradition… there is a surprise hidden for you in the middle! 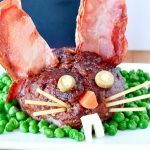 This Easter Bunny BBQ Meatloaf design was inspired by a German Magazine that my husband had several years ago. (I’d credit it but its long ago thrown away.) My husband is from Minnesota and learned to speak German when he was a kid. I don’t speak a word of German so I could only look at the pictures, but when I saw the bunny meatloaf I knew I would have to make it! My niece was about 7 at the time and I knew this would be fun to make with her. While I couldn’t read their recipe instructions I knew it would work just fine with my meatloaf recipe. Looking for Easter Food Ideas that are a little different for Easter Brunch? Its super easy to do. The best part, most things you will probably have in your kitchen and they are all edible in case a little ones hands get to them! Cut the eyes out of olives then put some yellow egg yolks in the center for color. You can use regular bacon to make the ears but I like prosciutto better because they are shaped more life-like. To make the rabbits teeth, you can cut them out of a hard boiled egg white. You can also use a hard boiled egg white to make a tail. What is the Surprise in this Easter Brunch Idea? 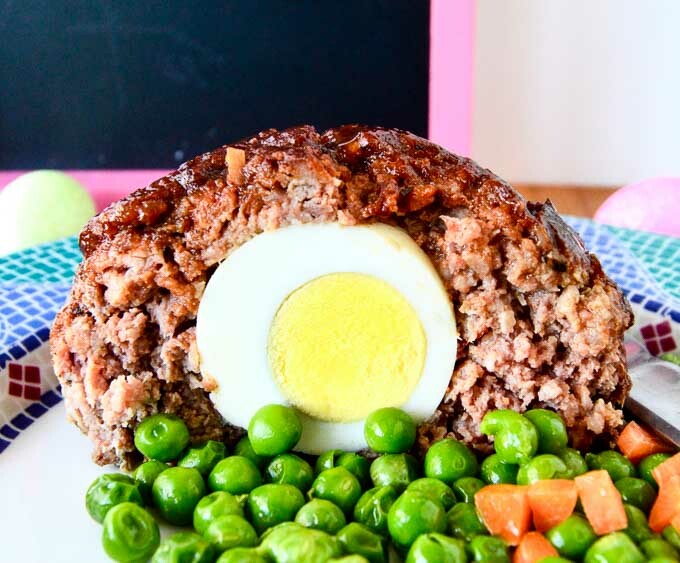 You bake the Easter Bunny BBQ Meatloaf with a hard-boiled egg in the center! When you cut into the meatloaf to serve it you have something that looks like this! 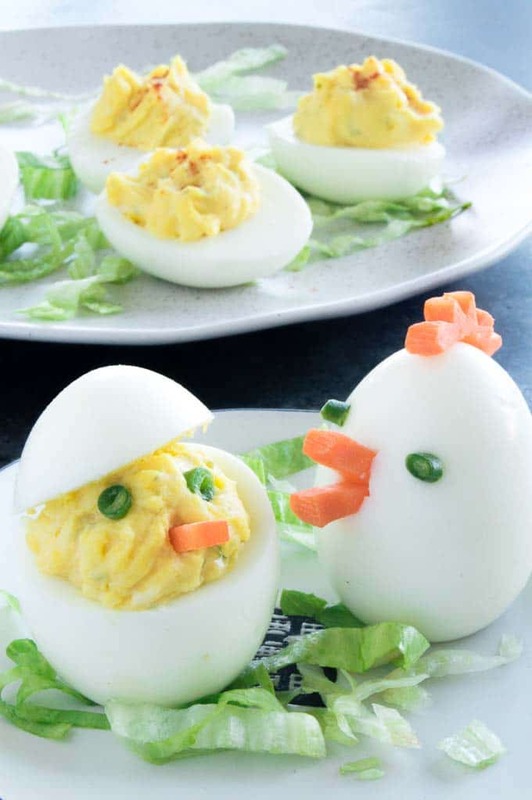 If you are looking for more fun Easter Ideas I also have this recipe for Easter Bunny and Chick Deviled eggs! They are super easy to make with things you have in your house as well. 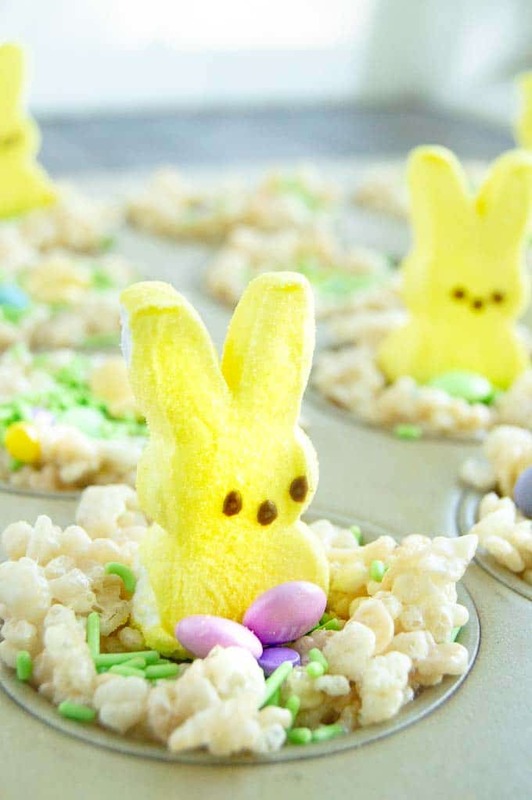 Gluten Free Baskets with Peeps! 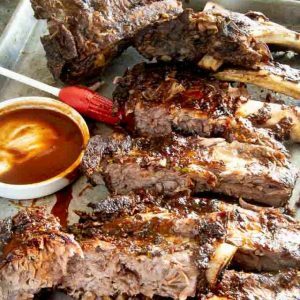 Pin this recipe to your Easter Board for ease of finding the recipe. Easter Bunny BBQ Meatloaf! 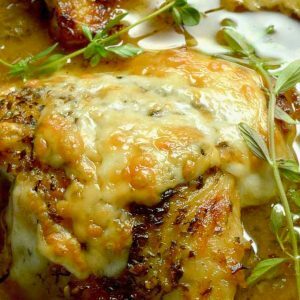 A recipe that’s fun to make, tastes delicious and a crowd pleaser for both kids and adults alike! Brushed with BBQ sauce, the meatloaf is juicy and tangy. The surprise in the middle is just icing on the cake! In a sauce pan place eggs in the bottom of pan, and cover with water. Bring water to a boil. You have to stay and watch the pan until it boils because as soon as it comes to a boil you will need to cover/seal with the pans lid and turn off the heat. Let eggs sit in the water, not removing the lid until 10 minutes have passed. At 10 minutes drain water let eggs cool before peeling. Peel 2 hard boiled eggs. Set aside. Add Onions, Parsley, Salt, Pepper, Panko and beaten egg. Mix Thoroughly. Form meatloaf into a flat oval shape, placing a peeled hard boiled egg into the center of meatloaf. Then wrap sides to seal egg in the center. The meatloaf ends up looking oval like the body of a bunny. 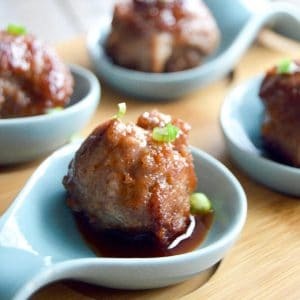 Brush Meatloaf with BBQ sauce. Brush Meatloaf periodically with additional BBQ sauce as it is cooking. Once meatloaf is at 160 degrees, remove from oven. Place Meatloaf on a cutting board to rest (under foil to maintain heat) for 15 minutes.. While Meatloaf is resting, brush one more time with bbq sauce and decorate to look like bunny. Cut carrot into triangle shape, about 1/2" long (makes it easy to push into the meatloaf. Cut olives into 1/4" circles, (In this picture I filled the center with leftover egg yolk, but you could also leave the pimento in the middle. Break spaghetti pasta into 3 inch pieces to use for whiskers. Cut the last egg in half. one half will be used for the "cotton tail". With the other half I used some of the egg yolk to use for the centers of the eyes. From the egg white I cut out white teeth. For the ears I used prosciutto and microwaved two pieces for each ear for 1 1/2 minutes after cutting the tops to be pointy like rabbit ears. Once it came time to decorate the meatloaf I cut the ears to the right size. Once Decorated serve on a platter with a knife to cut to order from the table. When cutting the egg will appear in the center as you are carving. Nutritional/Caloric information given was calculated using My Fitness Pal with the specific brands of ingredients I used in making this recipe. Please note that your caloric info could be different based upon what ingredients/brands you purchase. Look at the cute “cotton tail” here!! How clever is this?? My kids are going to flip out when i cut into it and theres an egg inside!! Oh my goodness! Super cute and so fun this would be the centerpiece of anyone’s table what a great idea for Easter! This is such a cute idea for spring! I would have never thought of this! So clever! Wow – what an impressive meatloaf to pull out at Easter. Very impressive. My kids will love this. My german mom used to make meatloaf with a hardboiled egg in the center. I was surprised when a co worker from Senegal also made a meatloaf with a hardboiled egg in it for a pitch in. She told me this was a popular dish for Senegalese. 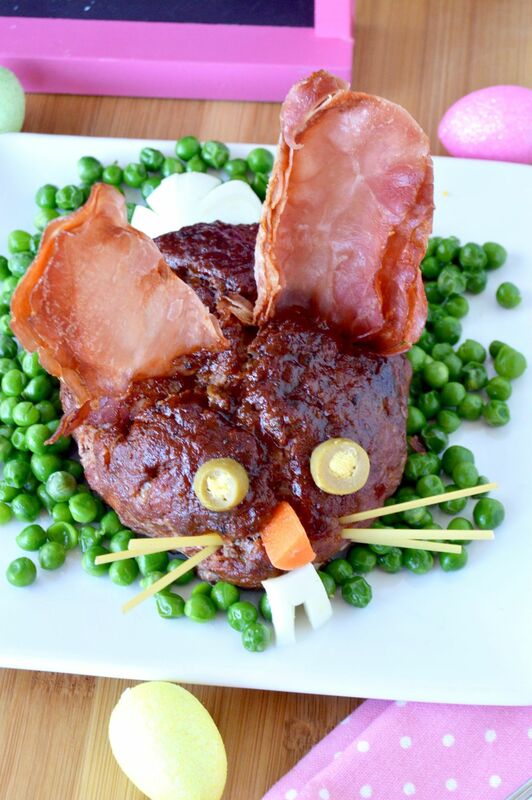 Oh what an adorable way to dress up a meatloaf for Easter. This is so amazing – and I love that it’s a tradition in your house. I made a mummy meatloaf a few years ago for Halloween, so this sounds right up my alley. I love that idea…. I need to come up with a cute “halloween” idea for the meatloaf!! The ears of the bunny meatloaf are so cute. I once visited a friend’s uncle’s house and he was talking about putting hard boiled eggs in the center of his meatloaf. I had never heard of such a thing, and here it is again. I thought it was something he just imagined up. This is amazing for the kids on Easter! Oh my gosh that is the coolest meatloaf I have ever seen!! HILARIOUS! I had to pin this! This is so cute! 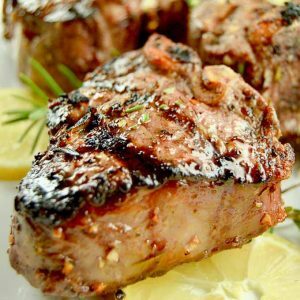 Perfect for Easter lunch or dinner! Great way to dress up dinner for the kids, or even plate for a get-together. Thanks for the tip. I’lll have to try it sometime. That is the most interesting meatloaf I’ve ever seen. And me with my boring rectangle or ring of meatloaf. oh my gosh – stop it! lol that is just the cutest meatloaf i have ever seen. look how creative you are! Brilliant idea for Easter and looks so cute! Haha, love it! I bet that kids would love putting this together too. Ha haaa, that’s adorable and brilliant! Love it! Oh gosh! My daughters would have loved this when they were little! This is adorable. You could even do single-serving little bunnies too! I have made a stuffed meatloaf before, using chopped hard-boiled eggs — which are really quite good with the meatloaf so I can just imagine what this recipe tastes like. Delicious! Love it!!!!! Will definitely be trying this for Easter.